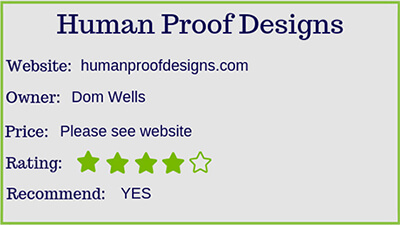 Human Proof Designs Review – How Does It Work? There are many companies out there who claim to provide pre-made sites for beginners in online marketing. I have been researching Dom Well’s business and I would like to give you my honest “Human Proof Designs” review. Let’s find out if this is a legitimate service or one of the many online scams. If you have been researching and came across their site, you undoubtedly have many questions. How does it work? Is it worth the money? Will they provide the support they promise? Will it make me money? There are likely many more questions running through your mind, so let take a deeper look, OK? 1 What Is Human Proof Designs? 2 Who Is HPD For? 3 Is It Worth The Cost? 4 Will This Website Make Me Money? Basically, his company makes ready-made websites you can buy! The owner, Dom Wells, decided he didn’t like the way unscrupulous developers were cloning “cookie cutter” sites and selling them for cheap. The unfortunate buyer would be sold a poor product with no training or support. These developers were there one day, gone the next. What he also noticed was newcomers interested in buying “niche” websites that had all the hard work done for them. Meaning the website design, content, and SEO with keywords. Please note that their prices are adjusted frequently. Please CLICK HERE for the current prices. These done-for-you websites will save you months of time spent on research, building your site, and writing content. And the training provided will help you scale your operations quickly. Your ready made site comes with its own initial content, but if you already have a website and are looking to outsource your content writing, you can hire their in-house writers to do it for you. They’ve written thousands of articles and know how to get you ranked. This is crucial for driving targeted traffic to your site. Everything is customized and tailored to suit your site. This included things like keywords, metadata, site speed, links, etc. and presented to you in monthly reports to see your progress. Over and above their individual training courses, they now offer a monthly membership with access to 16 modules of training, one live training each month, and access to coaching and a private Facebook group. Human Proof Designs offers their own hosting services as well as making recommendations if you wish to go elsewhere. Their website has instructional videos on various topics. As of the writing of this post, there are 46 podcasts. This is free for anyone to watch. There are great teaching articles on various topics, dating back to August 2013. Anyone can access these on their website. To date (Dec/18), they have built over 1350 affiliate sites, written 41K+ articles, researched over 179K keywords and created over 8K+ backlinks. This is for those of you who want to start with a premade niche website. You may not want to take the time to design a website yourself or get that initial content up. Those beginning months take a lot of work and research. This way, it’s all done for you. Human Proof Designs offers you pre-selected niches or lets you pick your own. They will then custom build your website, promising you that it was never re-cycled or duplicated. It comes with unique content, written by their own staff, that is SEO ready. This is all built on a premium theme, with premium plugins and images. For some people, these first steps are worth the investment in buying a pre-made site. I need to warn you though, the prices are fair, but can be expensive if you’re just starting out as an affiliate marketer. For those of you who wish to make the investment, but don’t know anything about websites, SEO, ranking etc, you don’t have to worry. Dom knows that there’s a learning curve for every new entrepreneur. Their manuals provide all the information you need to get started. It will show you how to grow your site and start earning money. They’ll also guide you to other services if you wish to monetize with email marketing, etc. If you have read any of my other reviews, I most likely said to be wary of any system that offers PBN (Private Blog Network) links. These can be very sketchy and considered a black-hat strategy by Google. This, in turn, will only hurt your business. But knowing Dom, and his desire to do everything the proper, ethical way, this is the one place I would feel comfortable using. It’s his own private Network, that he’s built with only quality and original articles. Nothing is recycled, and all links will be relevant to your site. Only you can answer this. Do you have the money? What is your time worth to you? Do you have experience? Personally, I believe it’s worth the cost, but only if you have the funds, to begin with. I would hate to see you go into debt, and then find out it’s not something you want to put the work into. There are very strict rules about refunds. They are only issued if your site was late and you no longer want to wait, or if there was a gross error on the site. Are you wanting to learn how to do this on your own, or would you rather let someone else do it for you? I found great satisfaction in learning how to build my own business from the ground up. Once it’s learned, you can repeat the process over and over again, as many times as you want. But, now that I know how the process works, buying a pre-made website is an appealing way to get a leg up on starting another new business. It could save a lot of time! Please keep in mind that this was their pricing as of December 2018. It may have changed by the time you’re reading this post. 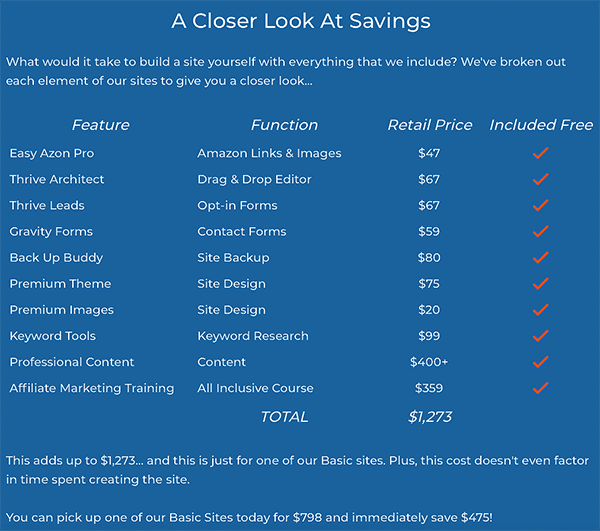 As you can see, the lowest price to buy your pre-made niche website is $798. If you did this all yourself, from various services online, it would most likely run you over $500. And that’s not using the quality products HPD uses. You should also consider the hours spent researching or the content you’d have to write. Hiring a writer to supply the content included could run you another $15 – $50/hour or anywhere from .10 – $1.00/word. 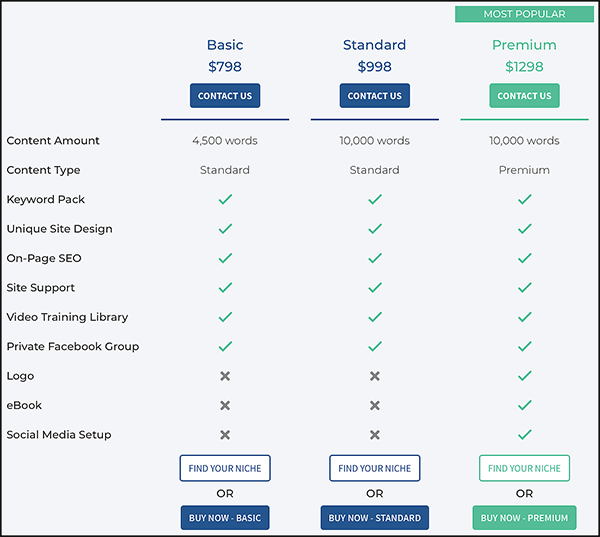 Human Proof Designs have broken down comparative costs to show you what you would have to pay to create the same site with the products and services they use. And the greater the package, the greater the savings. They do charge an additional fee for hosting…about $100/year or $8 to $9/month. hours of video training to show you how to get it up and running. instructions on how to continue working on your site. training on how to promote your site with keyword research and content writing. training on how to outsource tasks. free ongoing tech and email support. lifetime access to the training library. If writing content and researching keywords sound tedious to you, you can, of course, purchase additional packages for them to do that for you. These were listed above. The Human Proof Designs “aged” sites have been aging for 6 months or more, and have already gained ranking on the search engines. This feature alone saves you much time. Will This Website Make Me Money? Another difficult question… It all depends on how hard you work at it. Human Proof Designs are very honest and upfront about your needing to continue working on your website. If you expect to buy a website and forget about it, then you will be very disappointed and out a lot of money. Any website needs continual attention to bring in sales. Like any business, you need to think long term. They recommend putting yourself on a schedule of a couple of hours per day. Typically, their customers earn their 1st commission in 3 – 6 months. Nothing is guaranteed because it’s all due to time put in, the type of niche, and other outside factors they can’t control. I can tell you from personal experience, the more work and dedication you give your business, the quicker you will succeed. Think of it as a marathon rather than a sprint. The commissions will start to come, then continue to grow as you continue to work on your website. It takes time to build authority in Google’s eyes, and time to create a following. I believe Human Proof Designs is a legitimate company, offering pre-made websites with the beginner in mind. They appreciate the fact that there are people wanting to start an affiliate business, but have zero knowledge. Purchasing HPD websites is the beginning of your business, not the end. But keep in mind, this is not a shortcut to making money online. You need to continually invest your time into your business to reach its potential income. Without that time investment, you are just throwing away your money. Although I think the price is fair for everything you get, it’s still a lot of money for a beginner to pay. Isn’t it usually the people wanting to earn extra money with an affiliate business, are those who don’t have the extra money, to begin with? LOL. Truth be told, you can create your website business for considerably less money on your own if you’re willing to take the time. Can I recommend a wonderful place to do this? I would like to share with you the platform I used, and still use to run my business. And ironically, this is where Dom Wells learned as well. Yup, and he’s still a member! We have chatted several times within the platform. He is an awesome guy, always willing to help out. He’s just one of the many members who has created million dollar business after receiving their training from here. This platform not only provides all the training but has all the necessary tools for website building, hosting, keyword research and ‘live’ support. Everything under one roof. If you’re interested in checking it out…you can start for free! No credit card needed. Just click on the picture below to start your free membership. So what do you think of Human Proof Designs? Do you think your time is worth the investment? Let me know what you think in the comments below. I’d love to hear from you. And if you know anyone who would benefit from this review, please share! While it is good to know this service is legitimate, I think it is too expensive. If a beginner jumps into it right away without considering other programs, then it is bound to cause them to quit. Their most popular package is nearly $1,000. That is way too much. I do have a question though. I have heard that Wealthy Affiliate is a viable alternative, but I have been burned on the Internet before when looking at ways to make money online. If you had to put the difference between Wealthy Affiliate and other programs in one sentence, what would it be? I look forward to hearing your answer. I think that this article was well written. I also think that Human Proof Designs is overcharging people big time. What we have here at WA is much more cost effective and the education is excellent. But well written article. I believe you can go far with Wealthy Affiliate and have a very successful business. Thanks for your comment. Yes, I think they’re expensive too, especially compared to everything you get with Wealthy Affiliate. Their website building platform is very easy to use and you can have your website up in no time at all. And with the excellent education, you can design your website and become successful for a fraction of the cost. Thanks for the review. I agree that making money with on-line business is possible if you work hard on your website, otherwise it will be a loss. Personally,I started with WA in order to learn how to make money and found the process very exciting. It didn’t require a big investment , but requires time, a desire to learn, and take action. However, for people, who are willing to invest more money and do less work, Home Proof Design may be an accommodating tool. I certainly agree with you about Wealthy Affiliate. It’s an excellent way to learn at a fraction of the cost. Human Proof Designs is legitimate, and if you have the money, it is viable. But you still need to learn how to keep it going, online, to make any money. It’s not a short cut in that sense. Good article and review. Looks like they are for real but we can do the same thing on our own on Wealthy Affiliate with a little work. Yes, you are right. Wealthy Affiliate has all the proper education and tools to get our own websites up and running, then learn how to succeed. Wow! What an enterprise! I hope you see a lot of success with Wealthy Affiliate (I can only hope for the same)! Yes, Human Proof Designs is quite the business isn’t it. But for most people it’s much too expensive. At Wealthy Affiliate, you can learn to do this all yourself for very little expense.